This is astounding to me. I love this website: Nutrition Facts because this Dr. Greger does his research. So does Dr. Mercola. I thought that these toxic food dyes were banned decades ago, but interestingly they were not although the FDA tried many times. Watch the video or read the text below. Either wa y, we’re screwed. Is our government protecting us??? Unbelievable! Well, actually, it is believable knowing how corrupt our government is. “Fifteen million pounds of food dyes are sold every year in the U.S. Why? Foods “are artificially colored to make unattractive mixtures of basic ingredients and food additives acceptable to consumers.” Food colorings are added to countless processed food products to “conceal the absence of fruits, vegetables, or other ingredients and to make the food appear better or of greater value than it is.” Otherwise cherry popsicles might actually look as if they had no cherries in them! I’ve talked about the role of food dyes in causing ADHD symptoms in kids (See Food Dyes and ADHD), but what about their role in cancer? Due to cancer concerns, Red dye #1 was banned in 1961. Red #2 was banned in 1976, and Red #4 was banned soon after. But what about Red No. 3, used today in everything from sausage to maraschino cherries? It was found to cause DNA damage in human liver cells in vitro, comparable to the damage caused by a chemotherapy drug whose whole purpose is to break down DNA, but Red No. 3 was also found to influence children’s behavior over 30 years ago and to interfere with thyroid function over 40 years ago. Why is it still legal? By 1985, the FDA had already postponed action on banning the Red No. 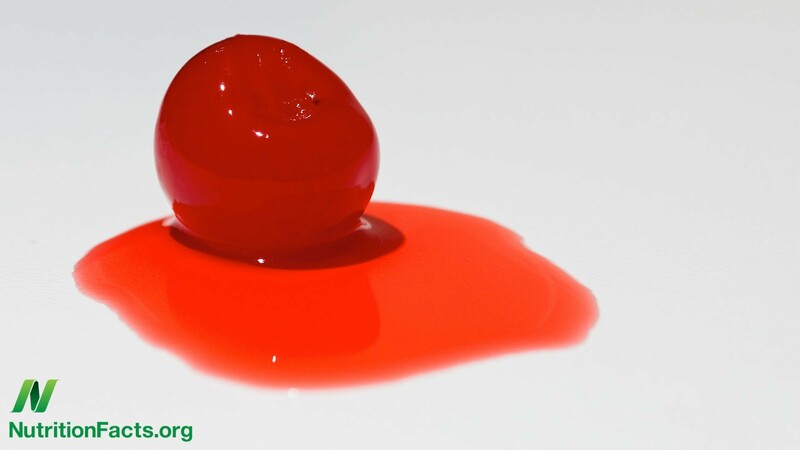 3 twenty-six times, even though the Acting Commissioner of the FDA said Red No. 3 was “of greatest public health concern,” imploring his agency to not knowingly allow continued exposure (at high levels in the case of Red No. 3) of the public to “a provisionally listed color additive that has clearly been shown to induce cancer while questions of mechanism are explored. The credibility of the Department of Health and Human Services would suffer if decisions are not made soon on each of these color additives.” That was over 30 years ago. (To see the 1985 article published in the New York Times, check out my video, Red no. 3, Coloring to Dye for). At the end of the day, industry pressure won out. While FDA scientists and FDA commissioners have recommended that the additive be banned, there has been tremendous pressure to delay the recommendations from being implemented. Blue #1 (Brilliant Blue) An unpublished study suggested the possibility that Blue 1 caused kidney tumors in mice. What it’s in: Baked goods, beverages, desert powders, candies, cereal, drugs, and other products. Blue #2 (Indigo Carmine) Causes a statistically significant incidence of tumors, particularly brain gliomas, in male rats. What it’s in: Colored beverages, candies, pet food, & other food and drugs. Red #40 (Allura Red) This is the most-widely used and consumed dye. It may accelerate the appearance of immune system tumors in mice. It also causes hypersensitivity (allergy-like) reactions in some consumers and might trigger hyperactivity in children. What it’s in: Beverages, bakery goods, dessert powders, candies, cereals, foods, drugs, and cosmetics.